The Eurocopter X3 (X-Cubed) is an experimental high-speed compound helicopter under development by Eurocopter. On June, 20th 2013 a Bloomberg L.P. special video report stated that the X3 is the World’s Fastest Helicopter by reaching a top speed of 472 km/h on several test flights. The X3 demonstrator is based on a Eurocopter EC155 helicopter with the addition of short span wings each fitted with a tractor propeller. The tractor propellers are gear driven from the two main turboshaft engines which also drive the five-bladed main rotor. The helicopter is designed to prove the concept of a high-speed helicopter which depends on the slowing down of the rotor speed to avoid drag from the advancing blade tip, and to avoid retreating blade stall by unloading the rotor while a small wing is intended to provide up to 80% lift instead. The X3 first flew on 6 September 2010 from French Délégation Générale de l’Armement facility at Istres-Le Tubé Air Base. On 12 May 2011 the X3 flew at a speed of 430 km/h (267 mph) for several minutes. Eurocopter intends to demonstrate the X3 in the USA in summer 2012. A product using X3 technology may come in 2020. On May 12, 2011 it demonstrated a speed of 232 knots (267 mph; 430 km/h). 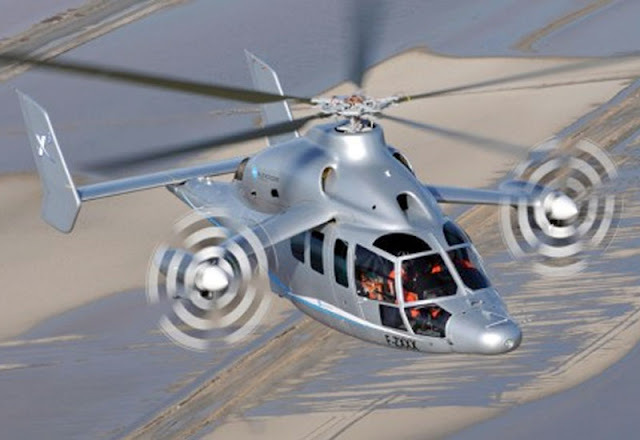 On June 7, 2013 it demonstrated a speed of 255 knots (293 mph; 472 km/h) beating Sikorsky X2’s world record, becoming the fastest compound helicopter as of June 2013. Propellers: 2-bladed five-bladed tractor propellers gear driven from main engines. Radio-controlled helicopters (also RC helicopters) are model aircraft which are distinct from RC airplanes because of the differences in construction, aerodynamics, and flight training. Several basic designs of RC helicopters exist, of which some (such as those with collective pitch, meaning blades which rotate on their longitudinal axis to vary or reverse lift so the pitch can be altered and can therefore change the angle of attack) are more maneuverable than others. The more maneuverable designs are often harder to fly, but benefit from greater aerobatic capabilities. Flight controls allow pilots to control the collective and throttle (usually linked together), the cyclic controls (pitch and roll), and the tail rotor (yaw). Controlling these in unison enables the helicopter to perform most of the same maneuvres as full-sized helicopters, such as hovering and backwards flight, and many that full-sized helicopters cannot, such as inverted flight (where collective pitch control provides negative blade pitch to hold heli up inverted, and pitch/yaw controls must be reversed by pilot). A helicopter is a type of rotorcraft in which lift and thrust are supplied by rotors. This allows the helicopter to take off and land vertically, to hover, and to fly forwards, backwards, and laterally. These attributes allow helicopters to be used in congested or isolated areas where fixed-wing aircraft would usually not be able to take off or land. The capability to hover efficiently for extended periods of time allows a helicopter to accomplish tasks that fixed-wing aircraft and other forms of vertical takeoff and landing aircraft cannot perform.